Joi Ito in Tokyo have posted the paper he was working on, on Emergent Democracy. Our online meeting happening was leading up to this, as was inspired discussions over e-mail the last couple of days, which I unfortunately didn't get around to participating in. But it is good stuff, which Joi hopes to make more perfect later on. "...[T]he tools and protocols of the Internet have not yet developed the necessary features to allow emergence to create a higher-level order. These tools are being developed and we are on the verge of an awakening of the Internet. This awakening will facilitate the anticipated political model enabled by technology to support some of the basic attributes of democracy, which have eroded as power has become concentrated within corporations and governments. It is possible that new technologies may enable a higher-level order through emergent properties, which will enable a form of emergent direct democracy capable of managing complex issues more effectively than the current form of representative democracy." "The world needs emergent democracy more than ever. The issues are too complex for representative governments to understand. Representatives of sovereign nations negotiating with each other in global dialog are also very limited in their ability to solve global issues. The monolithic media and their increasingly simplistic representation of the world can not provide the competition of ideas necessary to reach consensus. Emergent democracy has the potential to solve many of the problems we face in the exceedingly complex world at both the national and global scale. The community of toolmakers will build the tools necessary for an emergent democracy if the people support the effort and resist those who try to stifle this effort and destroy the commons." 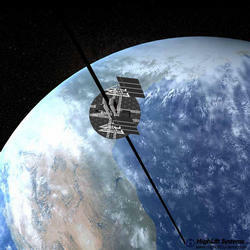 Some news about Highlift Systems who are planning on building elevators to geostationary orbit. They may have found a second location for the anchor of their space elevator - Perth, Western Australia, which apparently has the calm waters and international airport needed. The whole project has apparently gotten more momentum after the shuttle disaster. And with a startup cost of 7-10 billion, it will need a lot more support. It would act like the cable in the centre of a lift, with lift cars which could take people into space and back. The earth end of the ribbon would be connected to a terminal floating on the ocean about 100km off the coast which would use Perth Airport as an international contact point. Each lift car would be able to carry up to six people, with luggage and air supply. Travellers would be taken as a first step 100,000km into space to a space station. The station could be connected to more ribbons for journeys on to the moon or beyond. It might potentially reduce launch costs from the current $10-40,000 per kilogram to $100 per kilogram. Boeing are doing successful tests of planes with broadband Internet connections. 20-Mbit/second satellite connection for each plane, with ethernet by each seat. Still just a test, but they hope to install it more widely in 2004. Thomas Madsen-Mygdal mentioned a little while ago that the linx train between Copenhagen and Gothenburg is the first train with a broadband connection. What is interesting for both is not just that passengers can access the net, but also that it opens new possibilities for the crew, and better interactivity with the surrounding world. The train, for example, might be better at reporting its own position, and the crews in the planes might be more able to do their own flight planning.